The museum, which is part of the NC Dept. of Natural and Cultural Resources, opened in June of 1988, and since that time acquired and restored the 1897 Poe House and constructed a steel semblance of one of the arsenal’s four octagonal towers. In addition, the c.1840 Culbreth House was moved on site and restored. Combined with the museum proper, these historical resources spread nearly seven acres to create a historical complex unparalleled in the southeastern United States. The region’s rich and diverse history come to life for visitors through exhibitions, living-history programs, demonstrations, and other activities. The Cape Fear region and its environs are steeped in history. Native Americans settled the region; European immigrants, many of whom brought along their slaves, followed and found the land suited to their needs; Carolinians ratified the United States Constitution here; steamboats plied the Cape Fear River, connecting the region through trade to the rest of the nation and parts of Europe; and the Civil War ravaged towns and countryside alike. These stories, and more, unfold before visitors in the museum. Tours, special events, interactive programs, and living history demonstrations, enable the museum to connect with and relate to history. The Museum of the Cape Fear is a regional history museum. 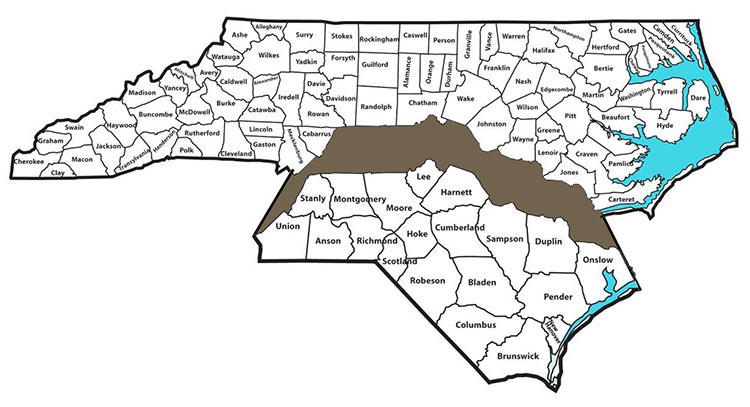 This North Carolina map with its 100 counties show the 20-county region interpreted by the museum. The Museum of the Cape Fear falls under the auspices of the North Carolina Department of Natural and Cultural Resources (DNCR). DNCR is the state agency with a vision to be the leader in using the state's cultural resources to build the social, cultural and economic future of North Carolina. Led by Secretary Susan W. Kluttz, DNCR's mission is to enrich lives and communities by creating opportunities to experience excellence in the arts, history and libraries in North Carolina that will spark creativity, stimulate learning, preserve the state's history and promote the creative economy. DNCR was the first state organization in the nation to include all agencies for arts and culture under one umbrella. Through arts efforts led by the N.C. Arts Council, the N.C. Symphony and the N.C. Museum of Art, DNCR offers the opportunity for enriching arts education for young and old alike and spurring the economic stimulus engine for our state's communities. DNCR's Divisions of State Archives, Historical Resources, State Historic Sites and State History Museums preserve, document and interpret North Carolina's rich cultural heritage to offer experiences of learning and reflection. DNCR's State Library of North Carolina is the principal library of state government and builds the capacity of all libraries in our state to develop and to offer access to educational resources through traditional and online collections including genealogy and resources for the blind and physically handicapped. NCDCR annually serves more than 19 million people through its 27 historic sites, seven history museums, two art museums, the nation's first state-supported Symphony Orchestra, the State Library, the N.C. Arts Council and the State Archives. DNCR champions our state's creative industry that accounts for more than 300,000 jobs and generates nearly $18.5 billion in revenues. For more information, please call (919) 807-7300 or visit www.ncdcr.gov.